We're a friendly place where your horse is our main concern! Lots of comfort for you and your horse! 12 acres with 6 seeded pastures for turnout. 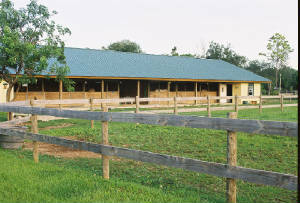 12x12 stalls, auto waterers, round pen, sand arena, concrete wash racks. For YOU! 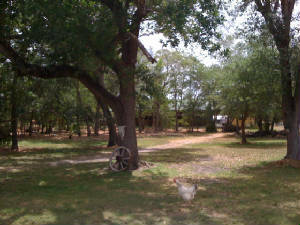 We have WI-FI and an air-conditioned tack room and picnic areas! 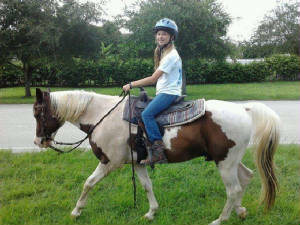 We offer full-board and pasture boarding (no stall) for your horses or farm animals. Please call for more info or come and check us out! and exercising available at reasonable rates. OK to bring your trainer, farrier, or veterinarian. Unlimited riding, using our horses and our equipment. Lease month-to-month for $600 per month. It's a GREAT way to see if you're ready for horse ownership!